A totally unique way to express how you feel for a birthday, love, wedding, appreciation. Perfect for any occasion! 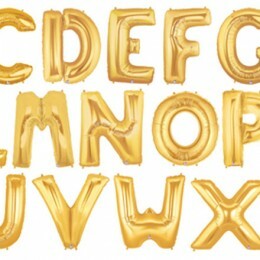 Option #1, Jumbo Gold Letter Balloons filled with helium attached to ribbon, $17 each, Limited Time - Sale $14.50. Must mention Website Promo when Ordering.